Maurice Hamilton is a landscape and travel photographer who resides in the San Francisco Bay Area. 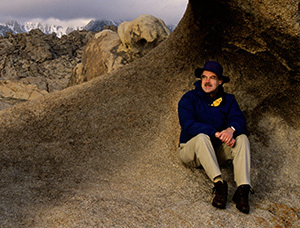 He is also an author whose publications include books published in English and Italian that describe photographic techniques using Adobe Photoshop and, most recently, photography books available in both print and digital formats that include images from the American Southwest and California. Pursuing another of his interests, Maurice uses the digital darkroom to create images of total solar eclipses that resemble very closely their appearance as perceived by the human eye. He published the steps he uses to reveal coronal detail in the May 2006 issue of Sky & Telescope magazine. Maurice captures his images using professional Nikon and Mamiya cameras and lenses to optimize image quality. Many of the images on this website were photographed using film, especially Fujichrome Velvia. These images were individually scanned using Nikon 8000/9000 and Tango drum scanners to extract maximal image detail from each film transparency. More recently, Maurice has used the Nikon D800E digital camera to create images with amazing detail. Maurice personally produces each print using state-of-the-art Epson Photo printers to make archival prints that surpass those from the chemical darkroom in both their color gamut and longevity. Information regarding the purchase of prints may be obtained by email at info@hamiltonphoto.com. Additional details are available from the Prints menu. Information regarding composite solar eclipse photography is available at this link: COMPOSITE SOLAR IMAGING TECHNIQUES.